Presenting the 'Pedal Project', a three part absolutely fantastic documentary series from Dublin City TV. The Pedal project is not a documentary – it is an ongoing debate emerging into public view in all its complexity and variety for the first time. The first part 'Three Cycling Cities' documents Dublin City Council cycling officer Ciaran Fallon taking his fold up bike, hitting the ferry and heading off on a whirlwind trip to look at models for European cycling. Along the way he meets bloggers and fashion designers and activists who all, incidentally, cycle bikes. The sequel 'Two Wheeled City' presents Dublin with a city transport system based on the car. We know this isn’t working – but what is the alternative and how do we get there? Speaking to academics and elected officials, council planners and staff, campaigners and cyclists - Two Wheeled City constructs a convincing case and viable plan to recast Dublin as a cyclable city. Healthier, cheaper, friendlier, faster – the case for normalising cycling has never been more powerfully put. The third installment 'One Less Car' takes a look at cycling in the City Center of Dublin. As a transport mode cycling is on the increase in Dublin. 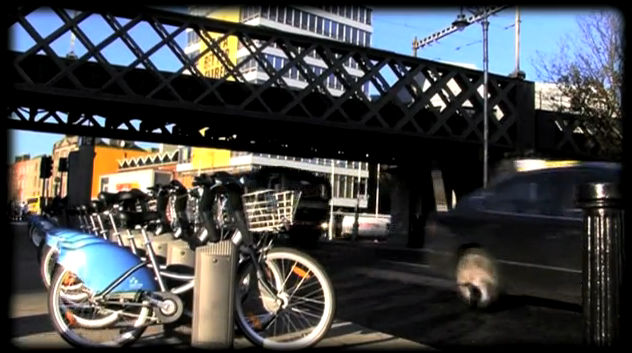 This documentary explores some of the many issues facing people who chose to cycle in Dublin. One Less Car doesn’t shy away from complex topics and, sometimes ambiguous or contradictory viewpoints. What emerges is the feel of a groundswell, of a phase transition as the act of re-imagining our city starts to see actual impact and gain critical mass. Part snapshot of the zeitgeist part cycling agit-prop.